Studies conducted in Europe have discovered that 75-100% of livestock feed contains multiple mycotoxins, which can negatively impact the health of animals. In 2017, multiple studies showed that mycotoxin levels in feed crops were on the rise. One of the most commonly affected crops is corn silage, which was found to have “extremely high levels of mycotoxins, particularly deoxynivalenol (DON), type A trichothecenes (T-2), fusaric acid and fumonism” in November. The implication of these reports is that farmers and livestock operators will have to take early precautions to help prevent livestock from ingesting mycotoxins and suffering from mycotoxicosis. Mycotoxicosis is a disease that occurs when livestock ingest feed or grains that have become contaminated with mycotoxins, or have been exposed to contaminated bedding. The animal’s liver and kidney can become impaired due to toxins and the central nervous system may be affected. The University of California, Davis reported that due to early and abnormally high rainfall in the Great Central Valley during 2017, mold growth was much more prominent than previous years and has caused an increase in mycotoxin levels in corn silage. A prominent factor in determining the level of mycotoxins in silages each year is the weather, especially when weather extremes are commonplace. 2017 was interspersed with excessively high temperatures and heavy rainfall, as well as extremely low temperatures and very dry conditions across the US. These intense weather situations were ideal for mold growth. Temperature: Many molds—like Aspergillus—grow best in warm, dry climates, while temperatures below 59 degrees fahrenheit hinder the growth of certain mold. Water Activity: High humidity and moisture levels aid the growth of certain molds which produce mycotoxins—like aflatoxin. Moisture is one of the most important elements needed to create an ideal environment for mold to grow. When dried maize fields have a moisture level that’s greater than 20% it creates a perfect environment for Fusarium to grow and produce mycotoxins. Microbes, like molds, utilize free water for survival and multiplication. The level of free water present in raw materials and feed is measured as water activity, and each organism has an optimal range of water activity in which it flourishes. Regulating the amount of moisture in feedstuff is an important step in preventing increased levels of microbes, and in turn, mycotoxins. One of the most effective ways to eliminate mold growth is to implement a moisture management program. Reducing the amount of moisture in feed and grain storage bins is extremely important. Aim to keep the moisture content below 10% to inhibit mold growth and reduce the opportunity for mycotoxin production levels to increase. If you’re concerned that your feed or grains could be infested with high levels of mycotoxins you should begin testing feedstuff. High-performance liquid chromatography (HPLC) uses analytics to identify components in the feedstuff being tested. Samples of feedstuff are sent to a lab, and the results can identify a broad range of mycotoxins using analytical chemistry techniques. Lateral Flow, also known as lateral flow immune-chromatographic assays, are less expensive than other tests and identify the presence or absence of mycotoxins found in feed mill receiving stations and grain elevators. Liquid chromatography-mass spectrometry (LC-MS) combines mass analysis spectrometry with liquid chromatography to detect and distinguish more types of mycotoxins than other tests. Enzyme-linked immunosorbent assays (ELISA) is a quick, accurate test that uses antibodies to find substances in feed ingredients and related feed byproducts that may indicate the presence of mycotoxins. When you pull samples for testing, make sure to get samples from multiple areas. For example, if you’re testing for mycotoxin levels in a feed storage bin, take samples from the top, sides, and bottom of the bin. Moisture levels may not be consistent throughout every section of a storage bin. 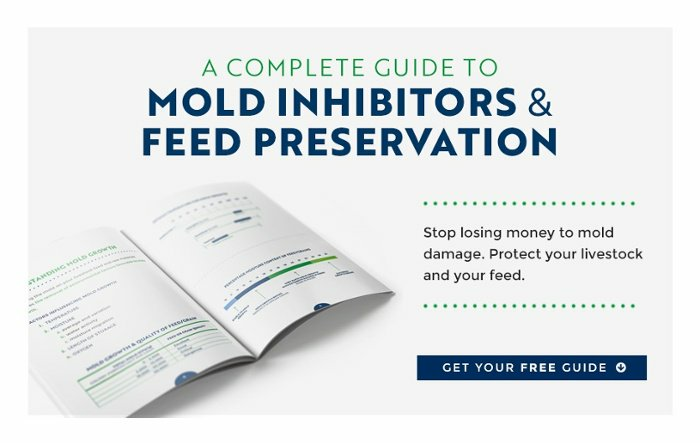 Once you know the levels of mycotoxins in the feed and grains your livestock consume, you’ll be better prepared to take preventative measures next time that will ensure your animals can achieve optimal health and maintain high productivity.